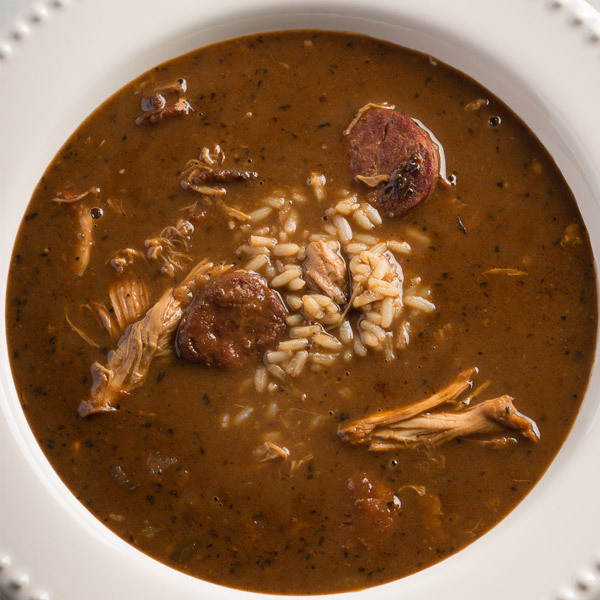 We were first introduced to this rich, dark-roux gumbo from one of our early chefs, Jimmy Smith, who grew up eating it in Cajun country. Its name is said to come from women who would cook the gumbo all day long while talking, or "ya-ya-ing." We love it, and would never dream of taking it off our menu. In fact, it's our number one selling soup. It is so beloved that customers actually fly in to New Orleans just for it. We sell fifty gallons of gumbo ya-ya a week, now that's a lot of soup! Making dark roux can be tricky so read over our kitchen notes on page 000 before starting this recipe. This recipe makes a lot of gumbo, six quarts, so you'll have enough for a big party or you can freeze some for later. In a 12-quart stockpot melt butter over low heat. Gradually add 1 cup flour, stirring constantly with a wooden spoon, and cook, stirring constantly, 30 seconds. Add 1 cup flour and stir constantly 30 seconds. Add remaining cup flour and stir constantly 30 seconds. Continue to cook roux, stirring constantly, until it is the color of dark mahogany, about 45 minutes to 1 hour. Add bell peppers and stir constantly 30 seconds. Add onions and celery and stir constantly 30 seconds. Gradually add stock to roux, stirring constantly with a wooden spoon to prevent lumps. Add andouille, Creole seasoning, salt, black pepper, red pepper flakes, chili powder, thyme, garlic, and bay leaves and bring to a boil. Simmer gumbo, uncovered, 45 minutes, skimming off any fat and stirring occasionally. Add chicken meat and simmer 15 minutes. Adjust seasoning with salt and hot sauce. Serve over rice.